If you’re interested in building solid, cannon ball shoulders in the least amount of time, then please read on. The exercise I’m about to share with you is one that I’ve steered away from for many years due to a poor understanding of how it is performed and the results it can deliver. Upon much research, trial and error, and finally performing this exercise, all of my efforts paid off. A little about myself. I’m an exercise enthusiast and have been physically active all my life. When I was about 19 years old I became seriously interested in body building. Like so many other naive body builder beginners, I gravitated toward all of the muscle magazines and all of the pro body builder “fail safe” exercise routines for mass and size. Unfortunately, I’m a hard gainer. In the body building community this translates to an individual who can’t add body mass easily. Like so many other trainees, 90% of my exercises were isolation exercises. The exercises consisted of concentration curls, lateral raises, pectoral cross-overs, leg raises, hamstring curls, etc. Unfortunately, I never incorporated any of the “foundation” compound / multi-joint exercises – squat, dead lift, bench press, pull-up, etc. When I began performing the compound exercises…BAMM! I began to add strength and size. However, my shoulders were still weak and poorly developed. One day, that changed. One of the best exercises I had the most success with was the overhead shoulder press – performed either with dumbbells or a barbell. I found the secret! And boy was I happy.You see, there are three heads (areas of muscle) around the shoulder: anterior, posterior and medial head. When performing a shoulder press, all three of these heads are exercised. So many other shoulder exercises focus only on one or possibly two heads. And when performing those exercises, you’re limited to the amount of weight you can lift due to the type of exercise. With the shoulder press, you are not. Due to being a hard gainer, I only train using compound / multi-joint exercises. Additionally, I only train 3 days a week, allowing plenty of time for recovery. 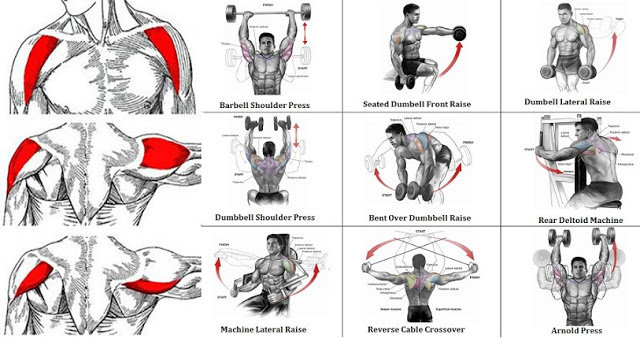 When performing the shoulder press, I use both the dumbbell and barbell. When lifting the weight, pressing straight over head, I will sit in either a chair with a strong back, or a bench with a back support. When pressing the weight over head, I’ll look up toward the ceiling. I find this to be easier on my neck – less chance of an injury. This is truly a wonderful exercise. If you’re looking to add mass to your shoulder area, including the neck area, then I can’t recommend the shoulder press enough. This particular exercise, along with the dead lift, pull-up, and dip, I’ve managed to add 30 pounds of muscle to my “hard gainer” body frame. Good luck! Have fun! Be safe!